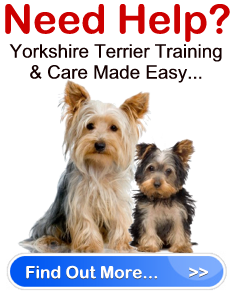 There is plenty for you to consider when searching for reputable yorkie breeders. In fact the biggest issue you will be faced with is determining whether or not the breeder you are interested in is legitimate. The best way for you to check the legitimacy of a Yorkshire Terrier breeder is to ask for references. In addition, if they are a first time breeder, ask them for the contact information of the breeder where they purchased the sire and/or dam of the liter. When given references, make sure you follow up on them. References mean nothing unless you take the time to contact them. If the breeder is not willing to give you references, this is a good indication that he or she is not serious about their business, and you should seek out another breeder. Moreover, legitimate Yorkie breeders will ask you for references so they can do a background check to make sure that you are ready for one of their dogs and will be a good owner. Finally, once you find Yorkie breeders you like, and you successfully choose a breeder you like, use this breeder as one of your references. Not only that, make sure you keep in close contact with the breeder, especially during the early years of your dogs life. That way, should you have any questions or concerns, you’ll have the best person to contact. Be smart: ask for references and make a breeder your friend.